Easy mango salad recipe with bananas uses fresh & sweet mangoes and banana as the main ingredients. 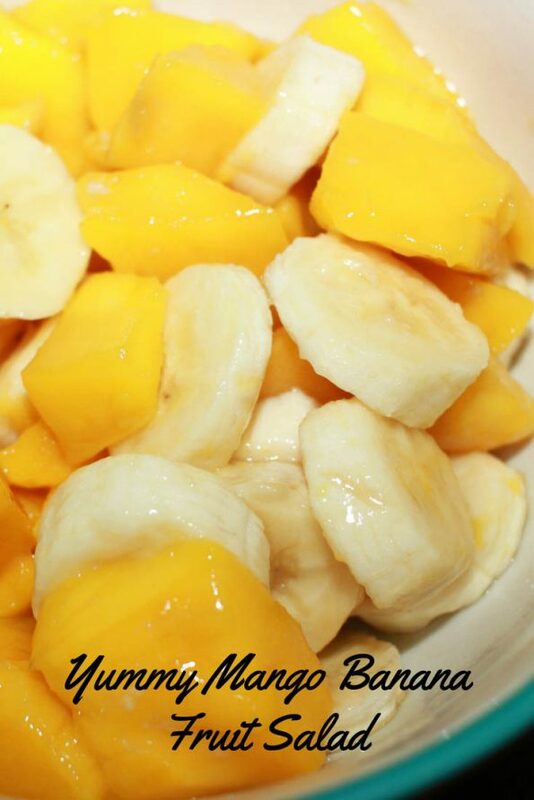 This is an easy, fresh, simple, refreshing & yummy fruit salad with sweet mangoes & bananas. Make sure to use fresh mangoes that are sweet, as frozen mangoes and sour mangoes may not work well for this mango salad recipe. This refreshing fruit salad is so easy to make, simple yet very delicious, kid friendly and makes a great fruit salad for breakfast, lunch, snack or dinner. This mango fruit salad with tropical fruits mangoes and bananas can be used as a healthy dessert, which is naturally sweet on its own. I used a tablespoon of sugar to sweeten it further, but you may skip the sugar or replace it pure honey if you wish. You may also call this an easy Indian mango fruit salad recipe as simple and refreshing summer fruit salads like this mango fruit salad is very popular in India especially during the summer and monsoon times when fresh mangoes are in season. Another popular mango recipe popular India is mango lassi recipe (Indian mango drink)and I have recipes for mango lassi using mango pulp and mango lassi using fresh mangoes and mango lassi is perfect as a cooling and refreshing summer drink during the hot summer months. 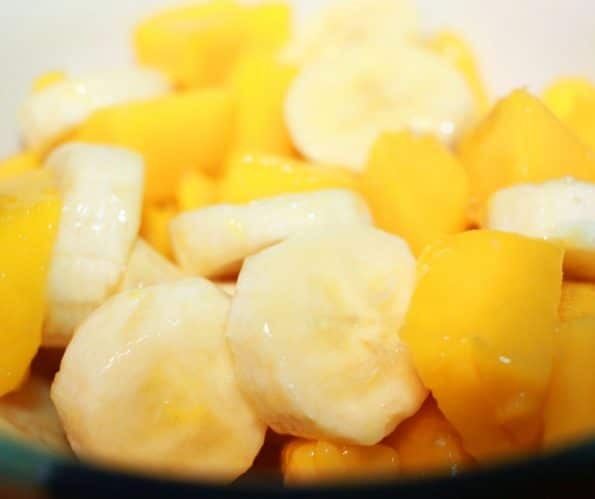 Fresh bananas are always available to make this yummy fruit salad and the addition of bananas make this fruit salad more healthy and delicious. 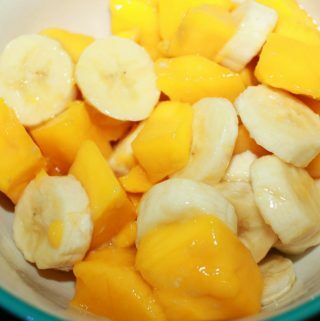 As I mentioned above, this is a fresh and easy summer fruit salad for easy breakfast and dinner using fresh tropical fruits, so this is a tropical style mango banana fruit salad recipe as well. You can also enjoy this as a very simple and delicious fruit dessert for your dinner. This is the kind of dish you can enjoy as dessert for breakfast. There is not much involved to make this sweet fruit salad other than cutting the mangoes and bananas. Peel the mangoes first and you can use a mango slicer to remove the pit/seed of the mango easily. You can slice the banana using a regular knife, but using a banana slicer will make the slicing fast and more safe than using a knife. One thing I want to tell you is to choose sweet mangoes for making mango based fruit salads as the sour ones can make the salad taste little tart, which is not recommended. However if you only have the sour mangoes and if you don’t mind the tart taste, you can make this salad and it will still be tasty. As I mentioned, I have used little sugar to sweeten it further, so even if your mangoes are sour, the sourness will greatly reduce with the addition of sugar. 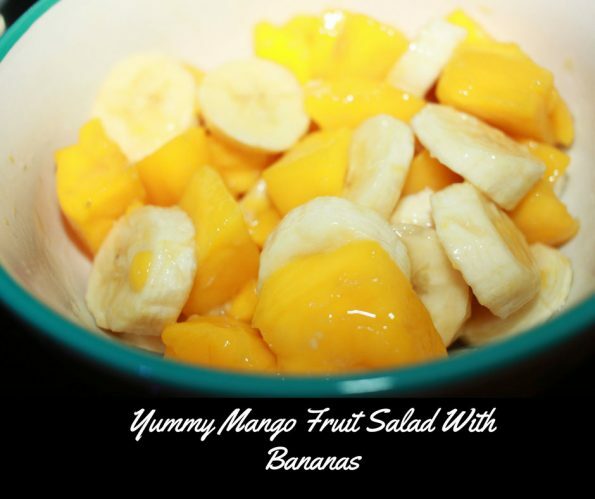 So here is how you can prepare this easy and fresh mango fruit salad following this easy mango salad recipe with bananas. Mangoes with bananas in sugar makes the most simple and delicious fruit salad which is perfect for summer or any time of the year when sweet fresh mangoes are available. Make sure to use sweet mangoes and avoid the sour ones for the best results. You may also try adding few drops of lime juice to the mix if you like it that way. As I mentioned in the ingredients list, we are using freshly cut sweet mangoes. You can peel the mangoes first, slice and remove the seeds and cut into medium sized pieces and transfer 2 cups of chopped mangoes it into a bowl. Add the sugar and mix well. Keep this for about 2 to 3 minutes so the sugar will dissolve and blend with the mangoes. Slice the banana in medium sized round slices and add this to the mangoes in sugar. Gently mix the fresh fruits with a spoon. Transfer the fruit salad to a salad bowl and serve! You can serve this yummy fruit salad at room temperature or serve chilled if you wish. If you don't serve the fruit salad right away, store it in the refrigerator for later use. 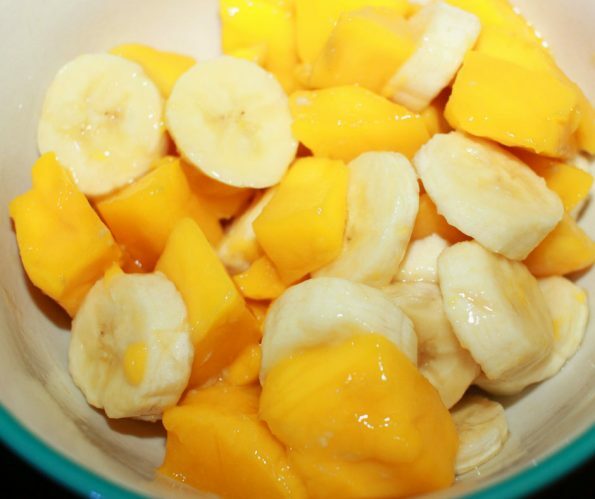 Hope you found this easy mango fruit salad recipe with fresh mangoes & bananas helpful!